Glitches with electronic music and information systems -- long a problem for automakers -- continue to plague the reliability of new cars, according to Consumer Reports. Models new for 2014 suffered electronics problems across a wide range of brands including Infiniti, Jeep, Fiat, Ram, Cadillac, Ford and Honda. And those weren't the only troubles. "Infotainment problems usually don't exist in a vacuum," says Jake Fisher, CR's director of automotive testing. "A closer look at the results suggests that cars with a lot of in-car electronic problems usually have plenty of other issues too." The magazine's annual reliability survey, available in the December issue and to subscribers online today, surveyed Consumer Reports subscribers about problems with cars they owned -- a total of 1.1 million vehicles. The issue includes reliability ratings of individual models in different vehicle segments. 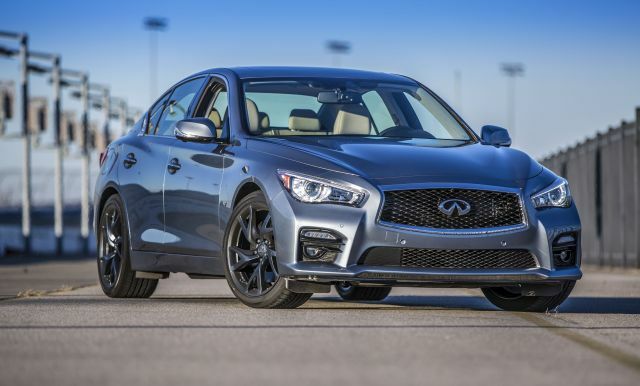 The worst new 2014 model for problems with so-called infotainment systems was the Infiniti Q50 sedan (pictured above). More than one in five owners reported problems with the Intouch system. Those issues, combined with a poor showing by the QX60 SUV, dropped the overall Infiniti brand rating from sixth last year to 20 this year among the 28 brands ranked. Ford and its Lincoln luxury brand, tormented for years by issues with their MyTouch infotainment systems, showed signs of solving these problems, CR said. For instance, complaints about the touch screen and related issues in the 2014 Ford Explorer dropped to three percent of owners compared with a an earlier peak of 28 percent. Perennial winner Lexus again topped the brand ratings for reliability, followed by Toyota, Mazda, Honda and Audi. Buick at sixth was the only U.S. domestic brand to make the top 10. Tesla was not ranked as a brand since it does not have the minimum of two models needed to qualify. However, the Tesla Model S -- praised by CR as one of the best vehicles it had ever tested in an earlier review -- got an average reliability rating and remains on CR's list of recommended vehicles. Most Japanese and Korean brands improved their reliability ratings. Subaru and Toyota Motors' Scion brand ranked seventh and eighth while Korea's Kia was 10th. Nissan lagged the other Japanese brands at 16th, while its luxury Infiniti brand dropped to 20th. With the exception of Buick, all U.S. domestic brands finished in the bottom half of the rankings. European brands -- with historically low ratings in this survey -- have improved. Audi, with a troubled history, now ranks fifth. Porsche and BMW finished in the top half of the rankings. Only Mercedes-Benz among European makes dropped significantly to 24th. The company was hurt by report reliability problems with the new CLA sedan and its top-of-the-line S-Class.